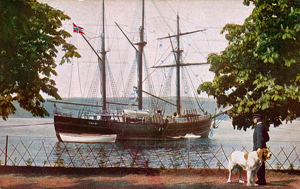 Fram ("Forward") was a ship used in expeditions in the Arctic and Antarctic regions by the Norwegian explorers Fridtjof Nansen, Otto Sverdrup, Oscar Wisting, and Roald Amundsen between 1893 and 1912. Fram was probably the strongest wooden ship ever built. It was designed by the Norwegian shipwright Colin Archer for Fridtjof Nansen's 1893 Arctic expedition in which Fram was supposed to freeze into the Arctic ice sheet and float with it over the North Pole.